Damn. It’s like hitting a wall. Or rather, it’s like a wall hitting you. 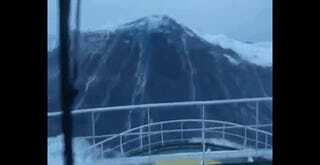 This footage shows giant wave after giant wave pummeling a ship and when you think they’ve finally weathered the storm, in comes the biggest and baddest wave that smacks the boat silly. The maniacal laughter from the person taking the footage might be the best part of the video though.